Preheat oven to 350 degrees F. Line cookie sheets with parchment paper; set aside. In a medium bowl combine all-purpose flour, whole wheat flour, baking soda, pumpkin pie spice, and salt; set aside. In a large mixing bowl beat butter with an electric mixer on medium to high speed for 30 seconds. Add granulated sugar and brown sugar. Beat until combined, scraping sides of bowl occasionally. Beat in eggs, one at a time, beating well after each addition. Beat in pumpkin and vanilla until combined. Beat in as much of the flour mixture as you can with the mixer. Stir in any remaining flour mixture and the chocolate. 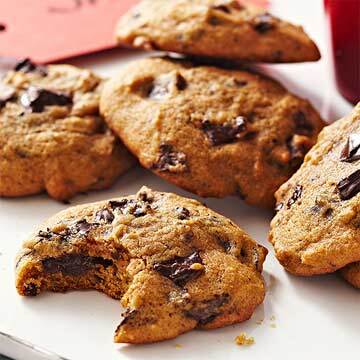 Drop dough in 2-tablespoon mounds 2 inches apart onto the prepared cookie sheets. Bake for 10 to 12 minutes or until edges are light brown. Cool on cookie sheets for 2 minutes. Transfer to a wire rack and let cool. To Store: Layer cookies between sheets of waxed paper in an airtight container; cover. Store at room temperature for up to 3 days or freeze for up to 3 months.